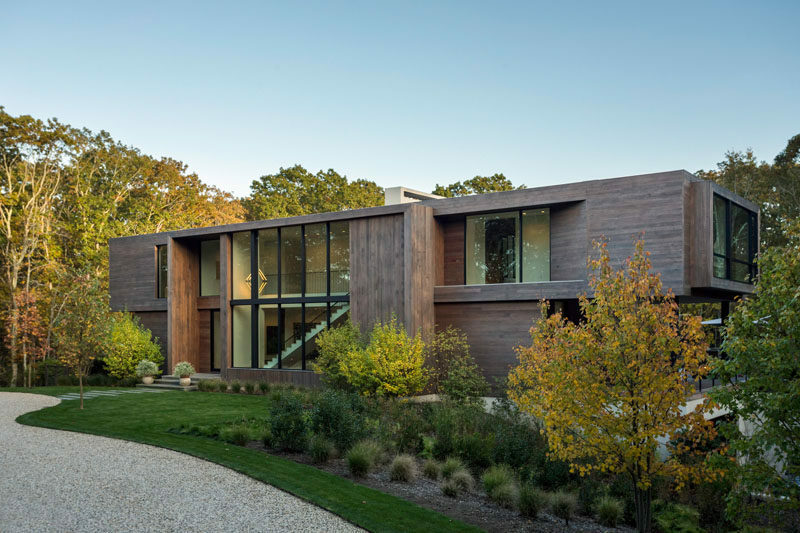 Blaze Makoid Architecture have designed a new house in Southampton, New York, for a couple who were attracted to the pristine surroundings, and envisioned the home as a secret enclave in the trees for themselves and their friends. 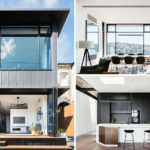 One of the homeowners is an interior designer who recently obtained an architecture degree and served as a key collaborator on the project and took on design challenges as part of the team. 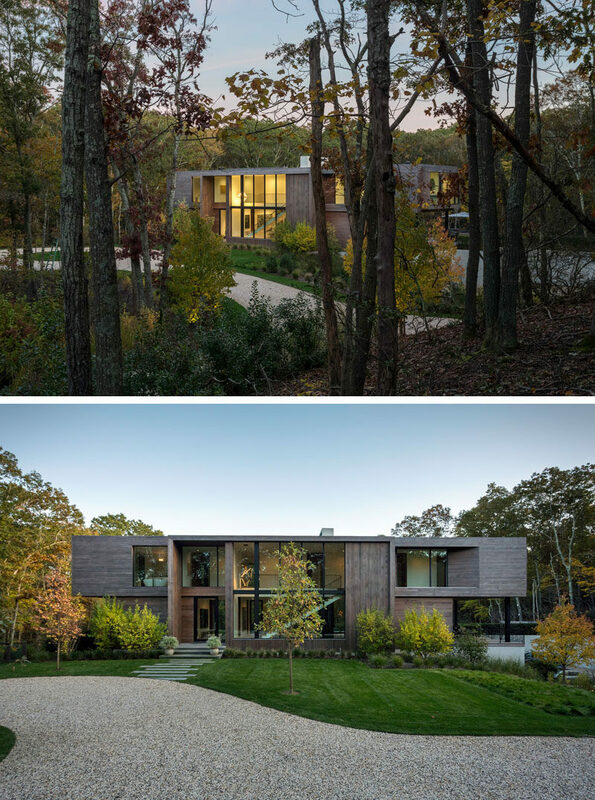 Stepping inside, the entryway has a large window that perfectly frames the trees outside. In the living room, the furniture is positioned to take advantage of the backyard view and the three-sided fireplace that’s clad in blackened steel. On the other side of the fireplace is the dining area, where a wood dining table is positioned under a collection of pendant lights hung at different heights. Behind the dining area is the kitchen, where open wood shelving complements the lower wood cabinets. 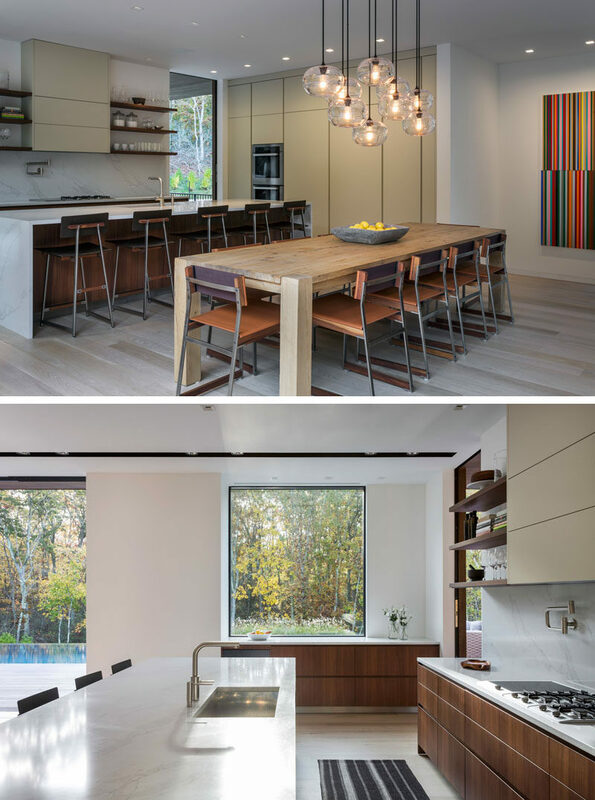 A 22.5 foot sliding door opens the interior of the home to the deck and swimming pool. Exterior stairs lead from the pool level down to a patio area and the rest of the backyard. 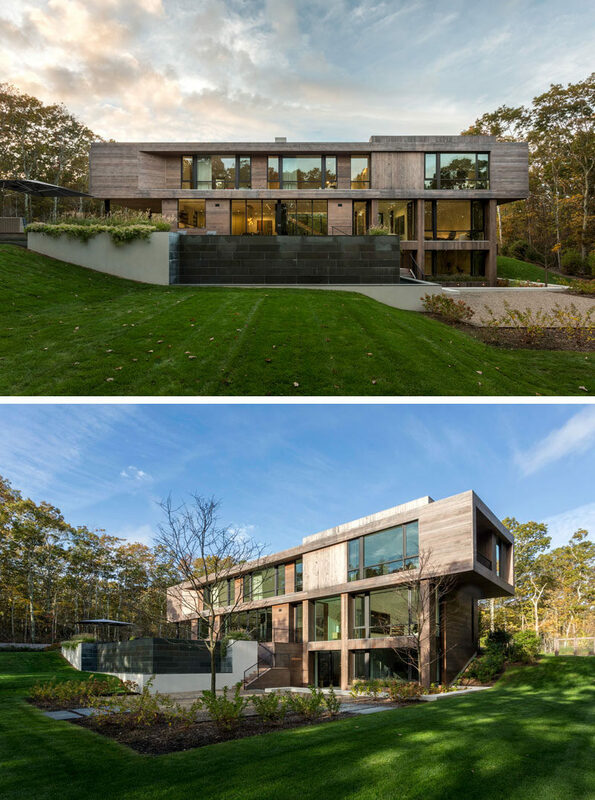 Back inside and beside a wall of windows, stairs with a black railing connect the multiple levels of the home. 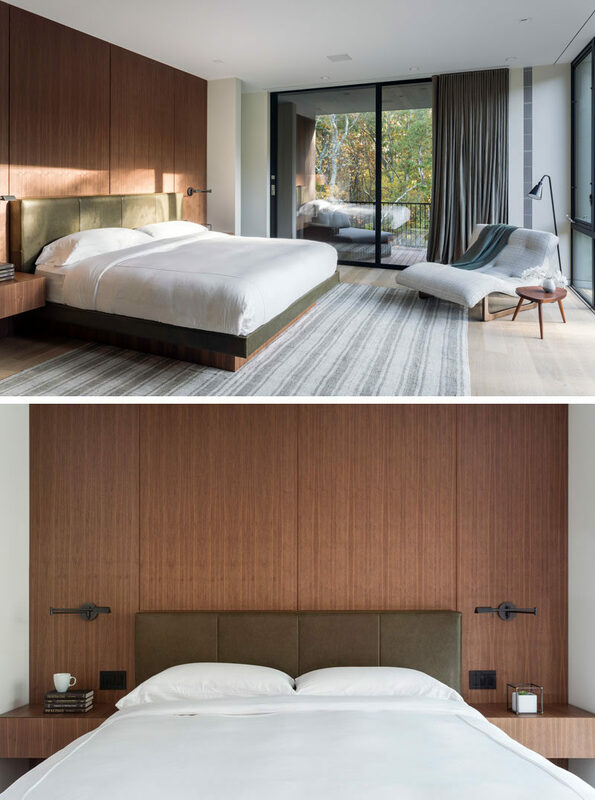 In the master bedroom, a wood accent wall becomes the backdrop for the bed, while a sliding glass door opens to a private balcony. In the master bathroom, a freestanding bathtub is positioned in front of the large window, that adds plenty of natural light to the room. 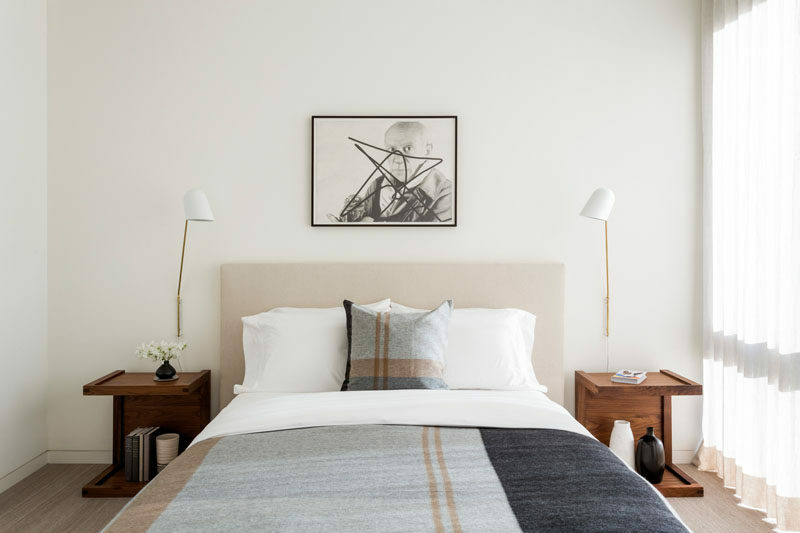 In another bedroom, the color palette has been kept neutral, creating a calm and relaxed environment. 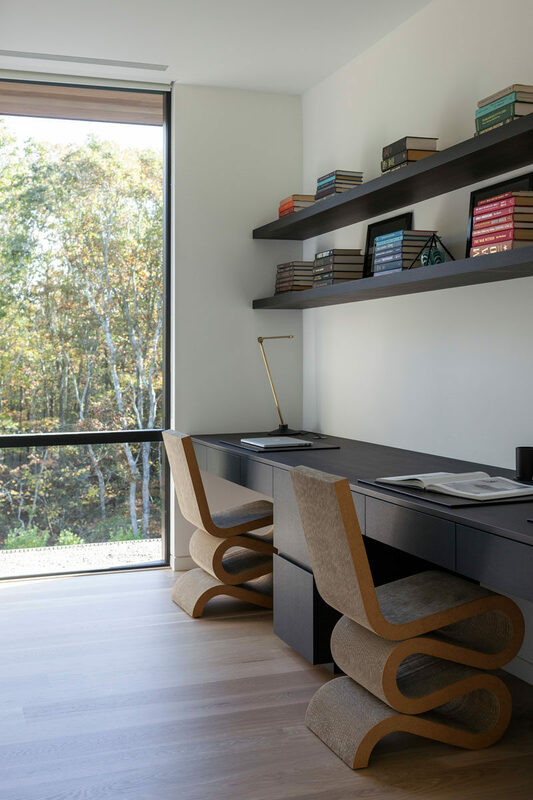 The home also has a home office that features a built-in desk with enough room for two people. 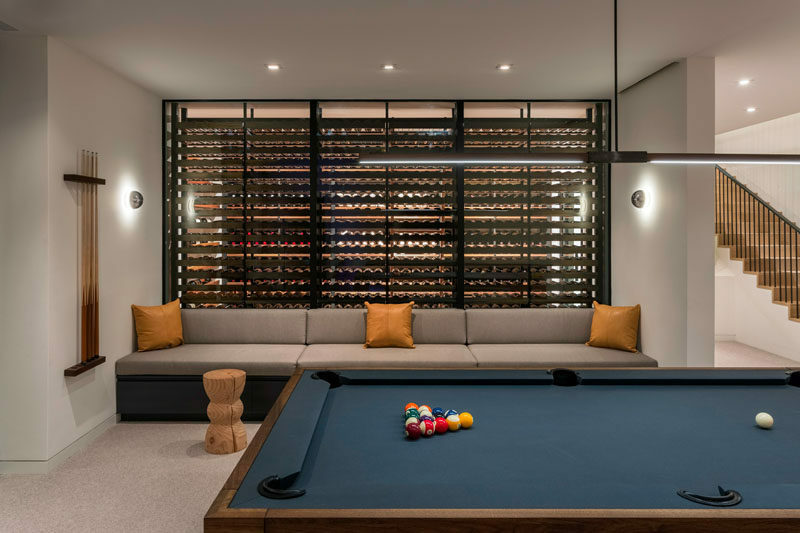 As the home owners have an extensive wine collection, a climate-controlled wine room was included in the design of the house. The wine room has blackened steel supports and custom walnut shelving, and is used as a back drop to a custom banquette in the game room.